We've got a great new Halloween release going on - starting today at Sassy Studio Designs! Our theme is of course - anything goes with Halloween. I used Powder Puff Sassy. I thought being that it's a Halloween theme that I'd zombie-fy my image. She's the prettiest zombie you ever did see LOL! I colored her with Copics using a lot of different grays - warm and cool. I went over her skin with G00 to help her look more zombie. I also colored some Tim Holtz washi tape. Now it's your turn to join in the fun! Make sure you check out all the great new designs and leave some blog love. A winner will be chosen from the comments. Enjoy! She is definitely a very pretty zombie Jodi. Love the green tinge to her skin. Jodi, i love how you colored her. I need to add that skin color to my Copic color chart of skin tones. Your DPs and washi tape are perfect. Someday I'll be as creative as you. I love that you made her a zombie. Awesome card. Totally love how you have transformed her into a zombie!!! Love it. WOW! Awesome coloring Jodi ... very clever idea! Thanks for fun and inspiration! She looks great!! Thank you for sharing which copics you used! I don't think I have G00 yet! Will have to get it! So cute!! Love how you colored her skin! Love it how you turned her into a zombie! Jodi, Powder Puff Sassy is indeed the coolest zombie. Love the color of her- so Halloweenish. Very clever card. What a fun card. I love her colored in green. Jodi, this is great and I love these colors. JODI!!!!!!!!!!!! Love love love how you made her into a zombie!! Awesome job!!! SOOOOO creative!! Love love love her as a zombie - your colouring is incredible!! WOW!!!! For a zombie she looks like out of space. Wonderful!!! I so totally love your zombie take on this! Thinking out of the box! Love it. 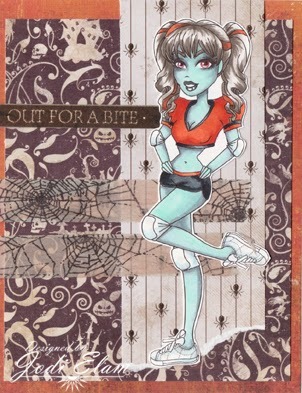 very cute, love how you "Zombied" her! LOL Love your sentiment! So appropriate. Awesome coloring on her - definitely get the zombie feel! Great!! Perfect colouring, love the DP's! I like the use of blue Jodie on your gal there thanks for the hop and enjoy your week! Bwahaha! LOVE the sentiment! Exquisite coloring and outstanding design! She definitely is one of the prettiest zombies I've seen! Jodi, really cool! Love that you made her a zombie. Awesome coloring. Wow! Your zombie is ROCKIN'! I just love how you colored her in and made her look so spooky! Great work! This is super, love the zombie skin tone.